I flew from DC to be in Texas from November 4th-17th. God opened many doors for me to communicate what God did while we prayed in Washington, DC with The Cause. First, I got to share and lead worship at my own church, Nacogdoches Christian Fellowship. On Tuesday I attended a fundraising event put on by a crisis pregnancy center in Lufkin, TX: the Pregnancy H.E.L.P. Center. A lady who survived a saline abortion Gianna Jessen gave her testimony! Her testimony was breathtaking. When it was over I played my new song for Gianna about the unborn, “Voiceless”. At the end of the week on Thursday I joined the many ministers of Lufkin for the Minister’s Alliance Prayer Lunch. We prayed at the Pregnancy H.E.L.P. Center I just mentioned previously. Tom Boggs, who had been with me during The Cause, and I prayed passionately for God to raise up deliverers for the many babies. As we ate lunch I talked with Dwyan Calvert of KSWP/KAVX radio. We scheduled a radio interview for the next day on their morning show. On Friday night my family and I went out for some Italian food at a restaurant in Lufkin. This is the kind of restaurant were the waiters wear tuxedos and bow-ties and they have live background music. My dad told the guy doing the music the story of what we did in DC and told him about my new song, “Voiceless”. Next thing I know I hear the guy from the mic asking me to sing it!! I got up there and he told me to tell the story of the song first. I was thinking to myself, okay, if you’re sure!! So I told the story ending it with the certainly out-of-protocol words: “this song is about the babies who have been killed by abortion”. For several seconds the restaurant was silent! Finally, I played my song about God hearing the voiceless babies even in their silence. One lady at a table near me was moved to tears. On the next Sunday I showed pictures and preached at Calvary Chapel, Dwyan Calvert’s church. Many were moved as I told the testimony of the prayer that went into these elections. 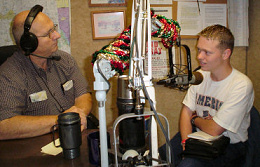 That night I went on the radio again with my dad on Y101.9 on The Bridge. I am constantly amazed at God and his desire to completely blow my mind!! He’s really good at that! I am now back on the Night Watch at the International House of Prayer in Kansas City. God is doing so much here as I stir up even these intercessors to pray for our government. Thank you again for your prayer and support. I am still amazed at what God does when we pray!